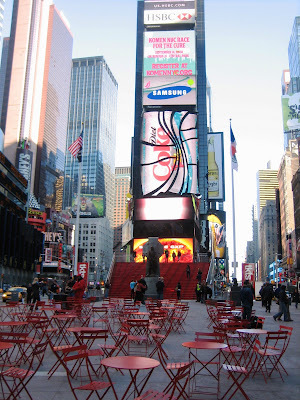 The TKTS booth is located in Duffy Square, at the north end of the Theatre District of Midtown New York, aka Times Square. 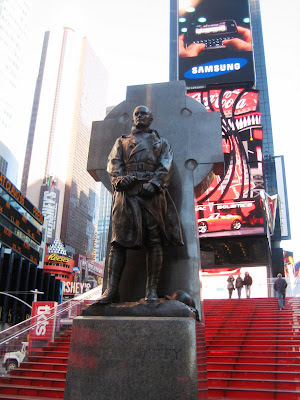 Duffy Square is named for Father Francis Duffy, a statue of whom guards the north end of the square. According to his wikipedia entry, he was a busy fellow. Most notably, in addition to doing all sort of Catholic priestly things in New York City, he served as a military chaplain during World War I with the 165th U.S. Infantry Regiment. He was awarded the Distinguished Service Cross and the Distinguished Service Medal, the Conspicuous Service Cross (New York State), the Legion d'Honneur (France), and the Croix de Guerre. At the south end of the square, another Irishman presides. 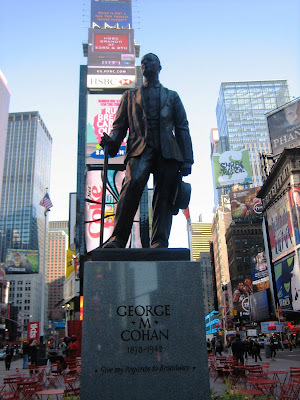 It's a salute to George Michael Cohan , "the man who owned Broadway" in the decade before World War I. George M. is considered the father of American musical comedy. 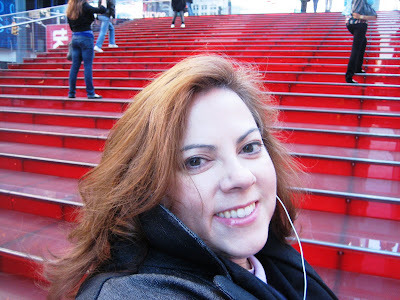 Now that the renovation of TKTS and Duffy Square is finally complete, the purpose is finally achieved: a place to get discount tickets for shows on Broadway, off-Broadway and around New York, a place to meet up, get pictures taken and just chill out. Love that photo of you, Sarah. Such a star!